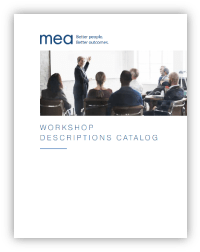 MEA has developed over 75 training workshops to suit a variety of your business needs. Available at our training center in King of Prussia, PA, or on-site at your facility, these workshops are designed in a way that adult learning and hands-on application contribute to the learner’s success. Some examples of our most requested workshop are: Stress Management, Juggling Multiple Priorities, Understanding Generational Differences and Handling Change. HR “BOOT CAMP” – Did HR Fall in Your Lap? Accountability: Stop the Blame Game! Substitutions are accepted and encouraged when you are unable to attend. If you are unable to attend a workshop, you may cancel up to 5 business days before the workshop and your company will not be billed. If you must cancel* within 5 business days, or if you do not cancel and do not attend, your company will be charged the full price of the workshop.